SO, HOW DOES A SHOCK ABSORBER WORK ? 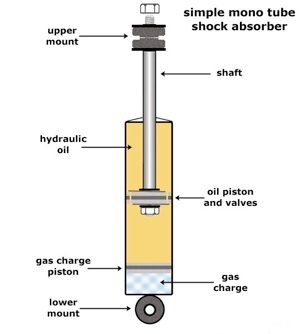 Typical shock absorber shim stack. need to prevent the rebound of the spring causing the car to bounce (pogo effect). travelling fast and hit several bumps in quick succession. SCORE Come off a pickup truck, so will be nice and stiff… how can you go wrong ? have to slow down because on every bend the back is stepping out ? car, at least find someone who has used the same shocks, and ask how they worked. so just the weight of the car sitting on the spring will compress it by 300/2 = 150mm. would be 190-150 = 40mm of bump stroke available. Using spring compressors to relieve the preload before dismantling a strut. OK… SO WHY NO PRELOAD ON G-REDDY COILOVERS ? contact with the road surface, meaning less available grip. The interweb is full of information on shocks and suspension mods and car setup tips. There are as many shock valving variations as there are shock absorber makers. Right click and view image to see how the construction varies from one to the other. which occupies some of the cylinder volume. the temperature at which the oil begins to foam is raised. AE86 owners will be driving every day.